Shoulder Instability, by Drs. Mark Provencher and Anthony Romeo, is the first comprehensive resource that helps you apply emerging research to effectively manage this condition using today’s best surgical and non-surgical approaches. Detailed illustrations and surgical and rehabilitation videos clearly demonstrate key techniques like bone loss treatment, non-operative rehabilitation methods, multidirectional instability, and more. You’ll also have access to the full contents online at www.expertconsult.com. Watch surgical and rehabilitation videos online and access the fully searchable text at www.expertconsult.com. Stay current on hot topics including instability with bone loss treatment, non-operative rehabilitation methods, multidirectional instability, and more. 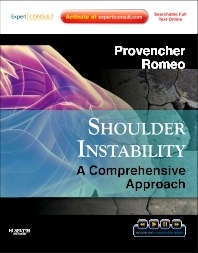 Gain a clear visual understanding of the treatment of shoulder instability from more than 850 images and illustrations. Find information quickly and easily with a consistent format that features pearls and pitfalls, bulleted key points, and color-coded side tabs. Explore shoulder instability further with annotated suggested readings that include level of evidence.